Ecce Cor Meum, Paul McCartney's fourth album of classical music, was written in English and Latin, with a score for orchestra and choir. Its title translates as 'Behold my heart', and in a religious context refers to the sacred heart of Jesus. 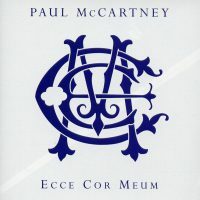 The words Ecce Cor Meum featured as a motto on McCartney's coat of arms, which was granted in June 2001 and also depicts a Liver bird holding a guitar in its claw. The origins of Ecce Cor Meum stretched back to 1997, when he and Linda McCartney visited Oxford University's Magdalen College. There, he was commissioned by Anthony Smith, who the following year became president of the college, to compose a piece for its recently-completed chapel. I was very excited by the idea. Linda and I went up there and stayed at the College. We went to the chapel; we heard the choir sing. Harmonically, it was all very interesting – I thought 'Wow!' It showed me the palette of where you could go. McCartney began writing the music which became Ecce Cor Meum, an oratorio in four movements, but was initially uncertain about the piece's subject matter. He knew the text should be in both Latin and English, and eventually found inspiration while taking part in a concert of music by John Tavener at New York's Church of St Ignatius Loyola. While I was waiting to do my bit I was looking around the church and I saw a statue, and underneath it was written 'Ecce Cor Meum'. I had done some Latin at school and I always had a fondness for it. So I worked it out. I believe it means 'Behold My Heart'. The work was delayed by the death of Linda in April 1998, and was not ready in time for the official opening of the auditorium. Instead, a verse film by Tony Harrison, Prometheus, was given its première for the launch. About a year or so into it, Linda passed away, which immediately held things up, and it went right on the back burner. Consequently I lost all momentum that I had gained in that first year and had to slowly start putting it back together. One of the ways that I did this was to just sort of write my sadness out. There is a lament in the middle called Interlude (Lament) which was very specifically grieving over Linda. I remember playing it to someone and they started welling up – which was great, because I hadn't told them that it was anything to do with Linda, but something in the chords communicated itself to this person, who was listening to it for the very first time. The première of Ecce Cor Meum took place on 10 November 2001 at the Sheldonian Theatre in Oxford, with Bill Ives conducting the Magdalen College Choir. McCartney attended the event with his new partner Heather Mills, whom he married the following year. The concert was attended by 1,000 people. The music was performed in two parts, the first featuring a choir of 13 boys and 13 men performing without instrumentation. Following the interval the oratorio Ecce Cor Meum was performed, which at this stage had four parts. According to the programme, these were titled Spiritus Spiritus, State Of Grace, Ecce Cor Meum and Musica. The oratorio was performed with 16 boys and 16 men, with a small symphony orchestra. At the end of the concert McCartney was invited to the front by Ives; he gave a speech and was presented with a bouquet of flowers. The première helped highlight several areas which needed further refinement. It was five years before the music was recorded, during which McCartney learnt a great deal about composition. Eventually I made it all come together through correcting a lot of misapprehensions – a lot was learned before the Sheldonian performance, but a lot of it was learned afterwards. An experienced choral composer knows that children can't be given huge sustained passages; they don't have the energy and the stamina. At the Sheldonian, there was some quite hard stuff that I didn't realise, because I'd done it on the synthesizer – which has endless stamina – but during that first performance, the solo treble couldn't come on for the second half. I think I'd used him up in the first half. These are things that people either learn because they are taught them immediately at the first lesson, or you learn through the years. So it was good to go through the piece a lot of times, and we took out huge choral sections and gave them to the orchestra. If it had been a Beatles song I would have known how to do it. But this was a completely different ball game. McCartney worked with several arrangers for advice and guidance, but ensured that all the music was his. They might say, 'That's too high for the horns,' so I'd listen to them and suggest the clarinets or oboes take the notes. They helped me arrange and notate, but the piece is totally mine. Ecce Cor Meum was recorded in Studio One at Abbey Road Studios between 13 and 17 March 2006. The performers were soprano Kate Royal, the boys of Magdalen College Choir, the boys of the Choir of King's College, Cambridge, and the Academy of St Martin-in-the-Fields. The conductor was Gavin Greenaway. The North American première of Ecce Cor Meum took place on 14 November 2006 at New York City's Carnegie Hall. Gavin Greenaway conducted the Orchestra of St Luke's, the Concert Chorale of New York and the American Boychoir, and Kate Royal again performed. Ecce Cor Meum was released in the UK on 25 September 2006, where it topped the classical charts. It was issued on the following day in the USA, and reached number two on the classical charts. In addition to the conventional compact disc release, there was a deluxe edition with an embossed cover and 60-page booklet, which was deleted after initial orders had been sold. On 3 May 2007 the Classical Brits took place at the Royal Albert Hall in London. McCartney was presented with the Best Album award, as voted by readers of Classic FM magazine and listeners to Classic FM.